Spanish real estate valuation and assessment specialists TINSA have released data showing that Spain's housing market is now recovering, amidst gradually improving economic conditions. House prices in Spain fell 3.03% during the year to the end of the second quarter, the lowest annual decline since the second quarter of 2008. In certain regions, Spanish house prices are beginning to increase slightly in the current quarter, with 0.15% growth recorded so far, according to the Spanish institute of statistics (INE) . Residential property transactions increased by a substantial 48% in the first quarter of 2014 from a year earlier as foreign investors recognise the bottom of the property market has finally been reached. Over the last six years, Spanish house prices have been consistently falling, with a total decline of 40% from the peak of the market in 2007, before the crisis. The current quarter's price increase follows 25 consecutive quarters of year-on-year declines which many foreign investors are seeing as a strong 'buy' signal. The Spanish economy has performed impressively over the last years, despite the country being one of the worst hit by the financial crisis. Increased domestic demand led to GDP growth of 0.4% in the first quarter of the year, with forecasts for 1.2% growth throughout 2014 and 1.8% in 2015. In the years from 1996 to 2007, Spain's national house prices rose by a staggering 197%, representing one of Europe's highest house price increases. These prices increases would have been virtually impossible to sustain even without the financial crisis but the added negative pressure brought about a massive downward shift in national prices leading to an overall fall of around 40%. The market's recovery is principally driven by foreign property buyers, favouring coastal areas and cities such as Madrid and Barcelona. Britons accounted for 15% of sales to overseas investors, followed by the French (10%), Russians (9%) and Belgians (7%), according to Spain's society of notaries. Apart from Madrid and Barcelona, house prices are highest on the Mediterranean coast in areas such as Andalucia and Valencia. Prior to the financial crisis, prices of coastal properties surged an average 250%, with hundreds of thousands of foreigners, mainly British, buying up property in those areas. The aftermath of the financial crisis brought about an abrupt end, as credit and foreign buyers dried up. The property market is one of the main drivers of the Spanish economy and when it slumped spectacularly, the nation's economy was battered. Spiralling unemployment ensued and property developers were left with blocks of unsold properties and huge debts. According to the Bank of Spain by the end of 2010, house prices had already fallen by around 17% from the 2007 peak. 2014 has seen a significant increase in foreign investors in Spanish real estate. Since the introduction of the Golden Visa scheme in 2013 which grants residency to non-EU investors upon a qualifying purchase, investor interest has increased from the Middle East, Asia and Russia. Marc Pritchard, sales and marketing director for Taylor Wimpey España said: "We have already seen a staggering 2,500% increase in Middle Eastern buyers this year versus the same period in 2012 and 190% increase in buyers from Russia and Lithuania." The cost of renting a home fell by 5.2% in January 2014 compared with 2014, to stand at €6.87 per square metre per month, according to fotocasa.es data which also showed a month-on-month decrease of 0.5%. Since the peak of the market in May 2007, rentals have declined by around 32% from €10.12 per square metre per month, with Aragón registering the biggest drop in rental prices of around -43%. Spokesperson for fotocasa.es, Beatriz Toribio said: "Although rental prices continue to fall due to the current economic climate, we ca see that the fall is slowing." Rental prices are expected to continue falling this year, albeit "very softly", meaning that in some areas of large cities will see increases in rental prices begin to appear. Over the last five years the supply and demand gap in the Spanish property market has been widening. The total housing stock stood at 25.3 million dwellings by the end of 2012 of which around 700,000 new dwellings remain unsold, according to analysts at Société Générale. 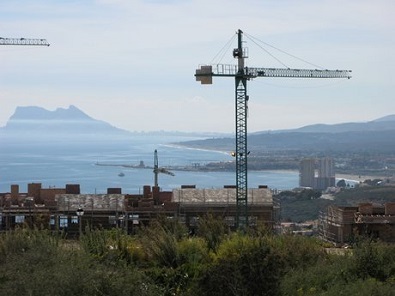 During 2013, licences to build new homes totalled 33,869, representing a decline of 23.3% compared to the same period in 2012 with 44,162 licences granted, and the lowest figure recorded since 2000, according to the Spanish Ministry of Development. TINSA believes that the housing glut will be cleared by 2017 and new constructions will pick up by the second half of 2015. At the height of the housing boom in 2007, housing investment was much higher than the OECD average, contributing 7.5% to the country's GDP. The construction industry became a key employer of low-skilled workers in the years prior to the global crisis, reducing unemployment from 24% in 1994 to 8.3% in 2007. However, since the crisis unemployment has risen to 1994 levels due to the significant contraction in the housing market. In terms of economic recovery, the situation in Spain remains largely in the hands of the property market. With foreign investor appetite for Spanish real estate at an all-time high in 2014, growth in the housing market is set to propel the country back to its place as one of the eurozone's largest economies.